Our guidance comes from the Lakota medicine wheel, which is our traditional symbol of the interconnectedness of our world. The medicine wheel represents not only the seven physical directions of north, east, south, west, sky, earth and inner self, but also the unity of the different races among humans with the spiritual and physical realms, Earth's basic elements, as well as the basic human needs. 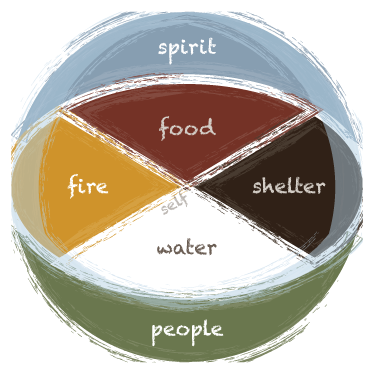 The human needs represented by the medicine wheel are food, fire, water, shelter, the spiritual and the physical world. All people need these elements for survival, yet many of us on Pine Ridge don't have secure access to basic needs. To enable the well-being of our people, OLCERI aims to open the path to crating a sustainable food supply, means of energy, clean water, and adequate shelter while enabling spiritual well-being and health of our community.